On this page we shall discuss the compressor face 40 probe rake which is the primary performance instrumentation for an inlet model. 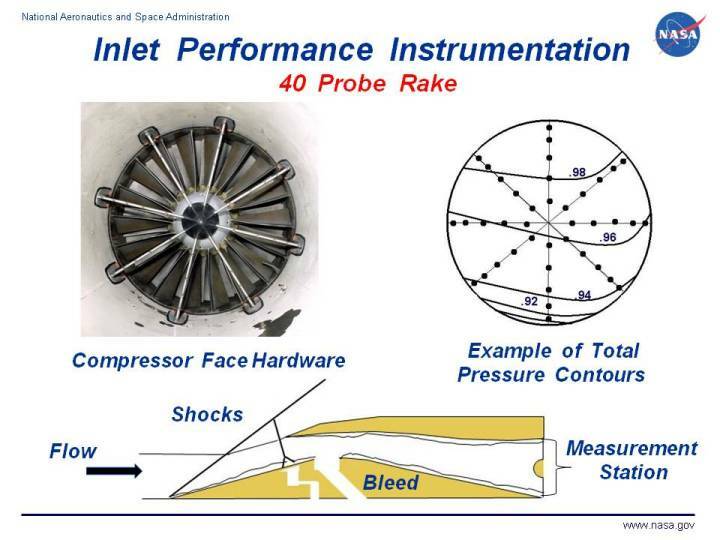 At the upper left of the figure, we show a photograph of a 40 probe rake that was flight tested on the NASA F-18 at the Dryden Flight Research Center. Similar, but physically smaller, rakes are normally mounted at the exit of inlet wind tunnel models. At the bottom of the figure, we show the location of the 40 probe rake on a schematic of an external compression inlet. The rake consists of 40 pitot tubes arranged as five rings with eight probes spaced 45 degrees apart on each ring. The small probes are difficult to see on the photograph, so we show a schematic layout of the probes at the upper right of the figure with the black dots representing the location of the probe tips. As with diagnostic probes, the tubes of the 40 probe rake are connected to pressure transducers to measure the value of the total pressure relative to some reference value. During a test, the flow through the inlet duct generates boundary layers along the surface of the inlet and pressure variations across the inlet because of flow turning, or upstream disturbances, such as shock waves. The schematic at the upper right shows a typical inlet pressure map with the numbers indicating lines of constant total pressure, and the black dots again indicating the location of the pressure probes. The probes are arranged so that both circumferential and radial variations of the pressure can be determined. Averaging the 40 measured total pressure values and dividing by the free stream total pressure produces the measured value of inlet pressure recovery. 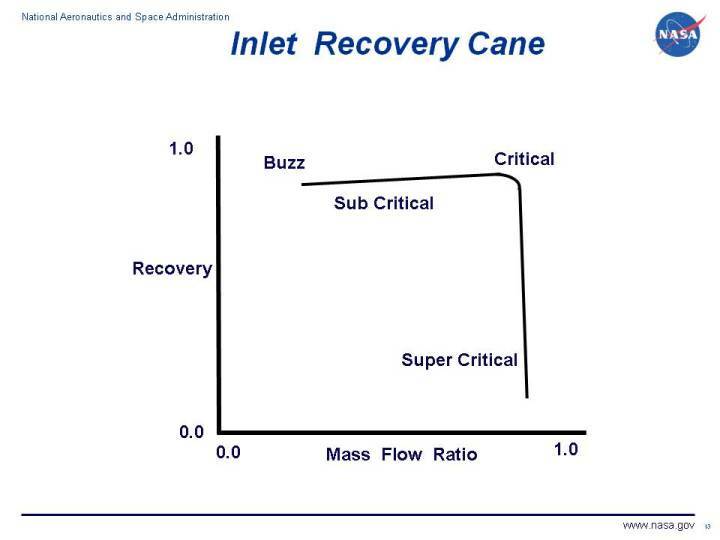 The effects of inlet design and engine operation on total pressure recovery are expressed in an inlet performance plot called a recovery cane. The figure shows inlet recovery for a supersonic external compression inlet plotted versus mass flow ratio at a single free stream Mach number. The mass flow ratio is the engine mass flow rate divided by the maximum mass flow rate that can be captured by the inlet. On the schematic at the bottom of the upper figure, we show a typical capture streamline as the thin horizontal line upstream of the inlet lip. The recovery is always less than 1.0 because of shock losses and boundary layer losses. The �knee� of the curve is labeled �Critical� and at this maximum mass flow ratio, the terminal normal shock sits at the cowl lip. For the lower mass flow ratios, labeled �Sub Critical�, the normal shock sits off of the cowl lip and excess mass is spilled around the cowl. At the lowest mass flow ratio the inlet is in buzz, an unsteady condition in which the normal moves at high frequency in the streamwise direction. For the �Super Critical� portion of the curve, the normal shock is pulled inside the cowl. Super critical mass flow ratio remains a constant because the mass flow through the cowl lip plane is fixed by supersonic conditions. The recovery decreases along the curve because the normal shock is pulled farther back into the diffuser, with an increase in Mach number upstream of the normal shock, and a resulting increase in total pressure loss. Notice that the mass flow ratio never equals 1.0 because there is always some amount of supersonic spillage from the external oblique shocks. During inlet wind tunnel testing, recovery canes are generated over a range of free stream Mach numbers. The measured pressure values are also used to calculate a wide variety of distortion coefficients that characterize the inlet flow field. The simplest coefficient takes the maximum pressure value measured minus the minimum value divided by the average total pressure. A more useful distortion coefficient is based on the maximum variation in pressure over a specified circumferential segment of the compressor face; DC60 for a 60 degree segment, DC90 for 90 degrees, etc. More sophisticated coefficients provide mass or area weighted parameters that account for both radial and circumferential variation. The wind tunnel test provides values of the inlet distortion coefficient over a range of flight conditions and exit airflow conditions. To determine the inlet compatibility with a gas turbine engine, the engine is independently tested with distortion screens placed upstream of the compressor. The screens are designed to produce specified values of selected distortion coefficients. The engine control schedule is then modified to provide an adequate stall margin across the engine operating envelope. Notice that the inlet and engine are not tested together until flight test. Research efforts are underway to improve the process for determining inlet distortion and its effect on the engine .